The Advanced Open Water Course is the next step on your scuba journey after Open Water and a course you should do some research on before you jump in! And that's what we are here for, let's talk you through what you AOW course will look like. In Open Water, you learned the basics of how to scuba dive. In Advanced, you are enhancing your skills, and learning how to think and act like a diver. It's the opportunity to gain more experience, continue your diving education and sample different scuba specialities under the supervision of an instructor. 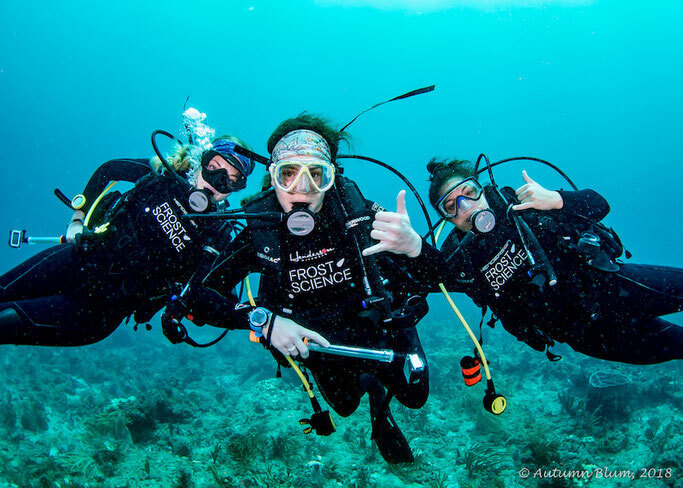 The PADI Advanced Open Water Course consists of 5 different adventure dives. An ‘adventure dive’ is the first dive of a speciality course. 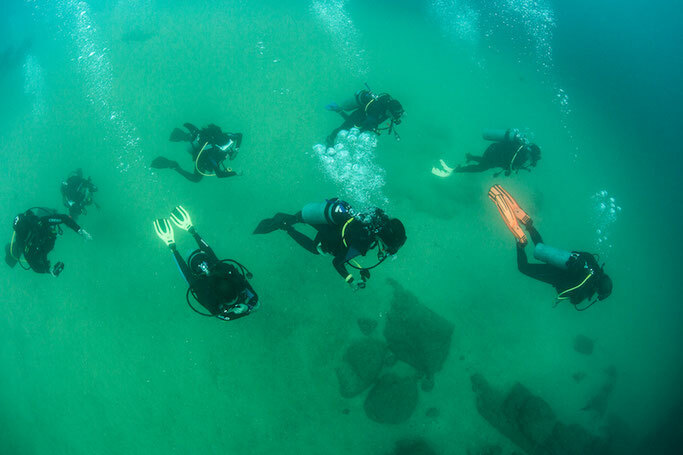 With over 26 PADI speciality courses to choose from, the Advanced Course will introduce you to the many different types of diving you can experience. 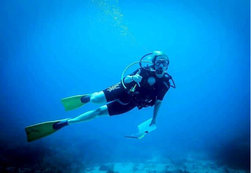 If you enjoy the adventure dives, you can pursue them further through speciality training. For instance, to obtain a full Wreck Diver Speciality certification, it requires three more dives with the corresponding training. Why should you do your advanced training? In short - it opens up more diving possibilities, enhances your skills, and is the next step on the learning ladder if you want to go on to become a dive professional. Once you graduate to PADI Advanced Open Water Diver, you can dive deeper. You’ll be certified to 30m/100ft, giving you access to a wider variety of dive sites and marine life. There are many sea creatures that you can't see at shallower depths, and wrecks are often found deeper than the 18m/60ft maximum your Open Water Certification allows you to go. If you want to go pro, you can then go on further to complete your Rescue, Dive Master and Instructor certifications! You do not need to be an advanced diver to take this course, all you need is your Open Water Certification. The Open Water Course will give you the necessary core competencies to continue on to the Advanced Course. Many students go straight from Open Water to Advanced Open Water and there is no minimum numbers of dives required. PADI (Junior) Open Water Divers who are at least 12 years old can step up and enroll in an Advanced Open Water Diver course, with some restrictions. After completing the Advanced Course they will be certified up to 21m/70ft, and will automatically upgrade to 30m/100ft when they turn 15. The Advanced Open Water Course is a fairly easiy courses to complete, as there are no quizzes, exams, or pool sessions. The PADI Advanced Open Water Course consists of 5 different adventure dives. You are required to do a knowledge review for each dive, which your instructor will go over with you before getting in the water. The course can be done over 2 or 3 days, with up to 3 dives being completed in one day. Usually this will consist of 2 dives during the day and a night dive, if you choose the night dive as one of your options. Of the five training dives you must complete, the Deep Dive and Underwater Navigation Dive are both mandatory. As you drop below 18m/60ft, your air consumption increases (due to the increased ambient pressure), no stop time decreases, buoyancy declines (as wetsuits compress), and you may begin to feel the effects of nitrogen narcosis. None of these are hard to deal with, as long as you know how to manage them.On your Deep Dive, you will learn how to deal with these effects, learn about color changes at depth, pressure changes, and test how susceptible you are to nitrogen narcosis. Getting ‘narced’: Nitrogen narcosis is an impairment of your thinking processes caused by breathing nitrogen under pressure. Some describe it as feeling drunk, or inhaling laughing gas. Often, it gives you a false sense of security and inappropriate euphoria. Theoretically, it affects all divers descending below 20m/66ft. Though for reasons not entirely understood, the severity of the narcosis varies greatly from diver to diver, and even from dive to dive. Symptoms of nitrogen narcosis can be dizziness, lightheadedness, elation, euphoria, anxiety, poor judgement or decreased coordination. Narcosis isn’t usually serious or over dramatic, it more commonly causes simple errors. However, it is important to be able to recognize and manage nitrogen narcosis, as simple errors can quickly become big problems for divers. Ascent reverses the symptoms of nitrogen narcosis and often, an ascent of only 10 or 20 feet will clear the fogged feeling in your brain. On your deep dive, most instructors will play a little game to test how nitrogen narcosis may affect you. An example would be completing a simple task, such as writing your name backwards, or solving a simple equation, and timing how long it takes you to complete at the surface. Once you get down to depth, they will ask you to complete the same task, and again time how long it takes. The simple task may no longer be as simple as it was at the surface! It will likely take longer to complete, with some people not being able to complete it at all. These exercises are a good demonstration of the physical effects that deep diving has on your body. Experiencing getting “narced” in a controlled environment should help you understand the possible consequences of deep diving, and how it affects you. Tips: An easy test you can do with your dive buddy to determine if one of you is experiencing Nitrogen Narcosis, is the finger test. One of you holds up a number of fingers, say 5, and the other must reply, holding up the same amount of fingers, plus one, 6. If they reply with any number other than 6, you should ascend to a shallower depth. While some people are natural navigators, many of us struggle with this skill, making the navigation dive one of the less popular specialties. However, it is a mandatory dive, because it is an important skill to learn. The priority of underwater navigation is to bring you back to the boat, shore or proper exit point safely. Good navigation techniques also increase your dive plan’s effectiveness. You’ll go directly to what you wish to see without wasting no-stop time and gas searching the site. You’ll practice your compass navigation skills on land first, and then refine those skills under the water, using kick cycles, visual landmarks, and time. If you’re nervous about the Navigational dive, you can practice this skill at home. Purchase your own compass, which is a good piece of equipment to own, or download a compass app on your phone. There are plenty of free options for both Android and IOS. Tips: When possible, take a heading towards the land before you drop down, and another in the direction of the dive site. This way if you get turned around under water, you’ll have two heading references to get you back on track. What optional adventure dives are there? Bear in mind that not all options are available at every dive centre, and can also depend on local conditions. If there is a dive speciality that you have your heart set on, research destinations and dive shops that offer it. 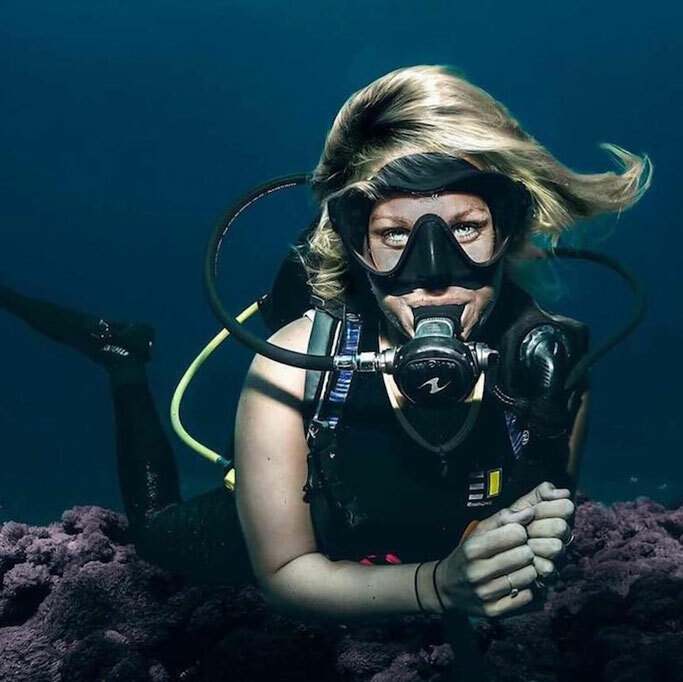 The Girls that Scuba Facebook Group is a great place to look for recommendations! What are the recommended optional dives? By far, the top choice that instructors will recommend is Peak Performance Buoyancy. Night and Drift Diving are also often recommended, because they are a lot of fun and help you learn to deal with more challenging dives. Popular choices among students are Wreck Diving, Photography, and Fish ID. Ask any diver, and they will tell you that buoyancy is one of the most important skills to master in scuba diving. It’s a skill that most new divers struggle with, so it is the most recommended training dive by instructors. Peak Performance Buoyancy will help you further understand how buoyancy affects you, and how to master it. It's one of the most helpful, and fun training dives. Hoops, rings, and other obstacles are often set up in a course-like style for divers to navigate through. While diving in the dark may seem daunting, it’s something most divers start off being very nervous about, and end up loving! On a night dive, you can spot sea creatures that are active at night, and hard to find during the day. In many places, you can also experience bioluminescence. These are tiny plankton type organisms in the water that glow when set in motion. A chemical reaction that takes place inside the plankton causes them to light up, like fireflies. They are beautiful and fascinating to experience. Once you’ve fallen in love with night diving and become comfortable in the dark, you can then go on to experience UV night diving. Imagine diving in Avatar, it really is an experience like no other. Read all about UV night diving here! 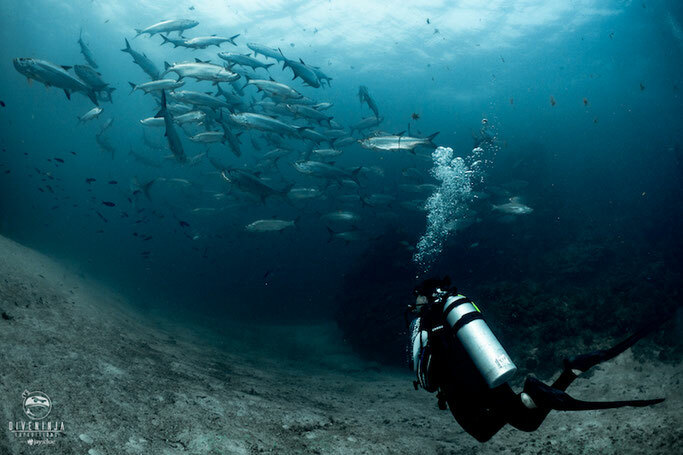 If you're nervous try diving the same place during the day time, so you feel more familiar with the dive site. Stay focused on the reef/wreck/dive site, if you stare out into the abyss, you might let your imagination swim wild! Stay close to your dive buddies and instructor. Everyone will have a flashlight, so the closer you are to the other divers, the more light there will be around you. Remember - it's not as scary as you think it is! Many dive sites around the world will involve currents, which can be challenging for new divers. In your Drift Diving Training, you learn how to manage currents to increase both your safety and enjoyment. It’s also another great training in buoyancy control. Done properly, drift diving can be both relaxing and exhilarating at the same time, and you’ll learn to how go with the flow as you use the currents to glide along. The skills you learn in this training are fundamental skills you will use many times in your diving adventures. A popular choice among students, wrecks are fascinating to explore, and are usually teeming with marine life. Ships, aircrafts, vehicles and more, whether purposely sunk or lost in an accident, offer a rewarding and adventurous experience for divers. While you won’t be able to penetrate the wreck on this training dive, you’ll learn about the hazards and safety techniques of wreck diving, and finning techniques to avoid stirring up sediment or disturbing the marine life. A skill your dive buddies will appreciate! This dive will teach you the basics of how to get a great shot underwater. From learning how to use the camera in this environment, and finning techniques and buoyancy control practices to get that perfect shot. You also focus on really slowing down and examining the dive site. It’s a great way to learn how to find and recognize marine life. While it is a popular choice among students, it’s not always the best choice for beginners. If you struggle a lot with buoyancy, adding a camera will only make things more difficult, and focus your attention on the camera instead of your surroundings. Always dive within your abilities. When you first start diving, you probably have no idea what you are looking at, but you know it’s amazing. This training is a great way to start learning all about the new world you have discovered. Instead of thinking ‘that’s a pretty fish!’, you’ll know it’s name. When you know what you are looking for, you’ll see things you may not have noticed otherwise. If you plan to continue on to your Rescue or Dive Master course, this is a great option to give you a head start. It introduces you to the knots and search patterns you will use in those courses. It also ties in with navigation and buoyancy, and we all know that practice makes perfect. When choosing your adventure dives, consider both the environment you are taking the course in, and where you’ll be diving in the future. If you’ll be doing mostly cold water diving, a dry suit course would be beneficial. If your interested in Nitrox, but still unsure, you can get a taste of it before committing to a full course. 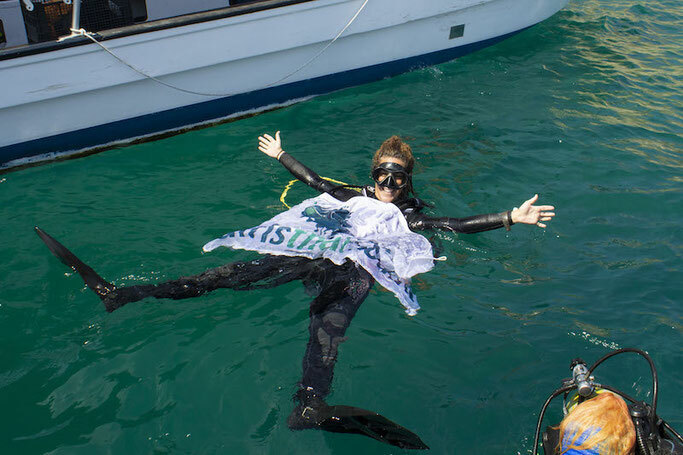 The Advanced Open Water Course is great because you are focusing on enhancing your diving skills, as well as exploring the world of possibilities. Aside from your normal dive gear , the additional equipment you will require will depend on the dives you choose! You will learn how to utilize more dive equipment, to enhance your dive experiences. You may end up using underwater photography equipment, reels, buoys, lift bags, a dry suit, a dive light, a dive flag, and more. For the mandatory navigational dive, you’ll need a compass and you may want to think about buying your first dive computer. Most dive shops will be able to provide any gear you may need, though it’s always good to double check before signing up for your course. 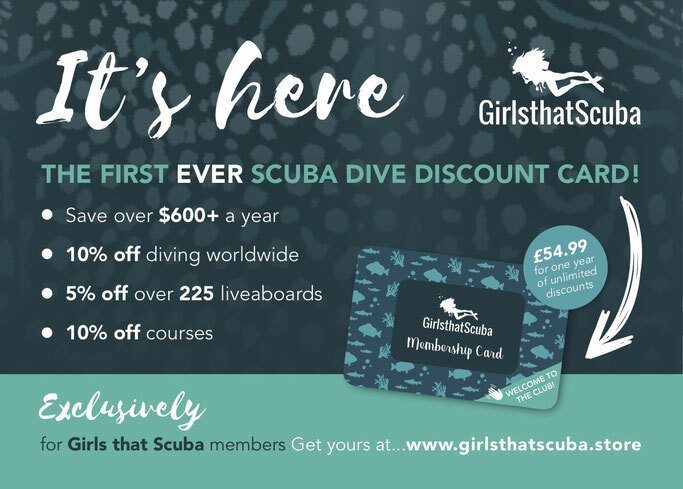 And don't forget to check out which dive centres offer you discount on our GTS Discount card!